About a year a a half ago, I was curious to see how many actual reported trade secret / noncompete decisions were issued each year. So, I did a “back of the envelope” calculation. 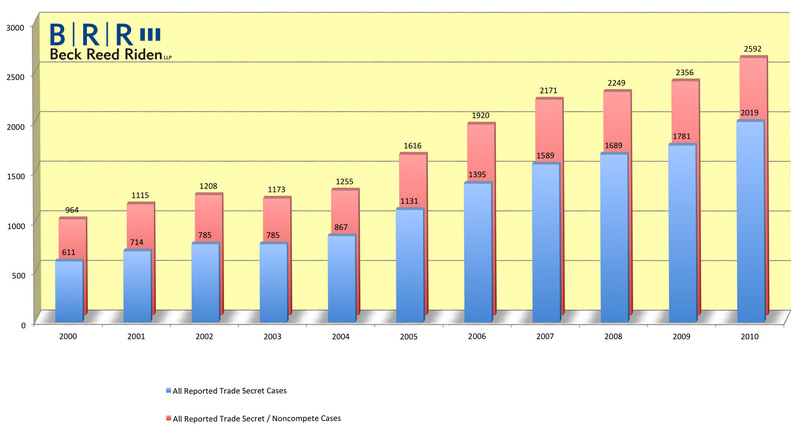 The results are here (with more information here) and they show an upward trend in the number of cases involving trade secrets and/or noncompetes. I tried again today (in preparation for my portion of a seminar I am chairing on intellectual property later this week). Other than noticing a slight drop in all of the numbers across the board (probably due to the way I ran the searches), I saw that the trend continued. I also ran a similar search for those cases involving just trade secrets regardless of whether they also involved noncompetes (i.e., leaving out any cases that involved noncompete agreements protecting something other than trade secrets). The results showed an almost identical trend.